Texas Music Office's May 2017 Newsletter, ft. an interview w/Kerrville Folk Festival producer Dalis Allen, TMO outreach, info on the largest record convention in the world taking place this weekend in Austin...and other TX Music opportunities! Look to this communication portal for music news, interviews highlighting various Texas musicians and music businesses, special events, and information about TMO programs and related events. Fest Producer Dalis Allen talks about the magic formula that keeps generations of families coming back year after year. Kristen DeWitt and Sara Hickman performing on the main stage at Kerrville Folk Festival. Photo courtesy of the festival. Kerrville Folk Festival Producer Dalis Allen has helped launch more music careers in her lifetime than 3 or 4 music professionals combined. She’s owned a booking agency, managed venues, worked for record labels. And now as one of the few women festival producers within a worldwide festival industry, she carries on the torch of her mentor, Kerrville Folk Festival founder Rod Kennedy (who passed away in 2014 at age 84 from natural causes). Seemingly the singular person to do the job after Kennedy’s retirement, Allen is a rock star of a folk festival promoter, helping grow one of the most renown, most respected folk festivals on Earth. She’s got the right mix of energy, charisma, and multi-tasking ability to be part evangelist and part talent scout, using her personal history and connection to the fest (she attended the inaugural Kerrville Folk Fest as a teen in 1972) to continue to steward the festival forward into the 21st century, just as festivals continue their rise as one of the most influential sectors in the music industry landscape. 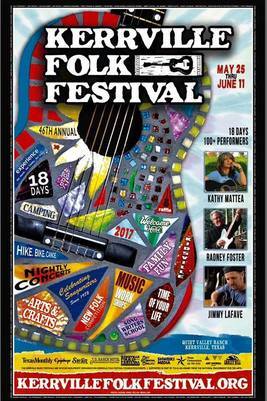 Few music festivals have a 46 year history and the cachet of the Kerrville Folk Festival…and that cachet comes from the careers they’ve helped launch over the years through Kerrville Folk Fest debut appearances: the Flatlanders (1972), Lucinda Williams (1974), Steve Earle (1978), Shawn Colvin (1988), Ani DiFranco (1994), the Dixie Chicks (1995), and countless others. Wimberley resident and musical prodigy Sarah Jarosz grew up attending the festival, and told Allen about how she used to dream of one day playing the main stage. A few years later many festival attendees would remember Jarosz’s fest set at the place they initially witnessed her stardom being born. This year’s line-up will again be uniquely special. Scheduled to appear at the evening concerts are festival regulars Trout Fishing in America, Jimmy LaFave, Terri Hendrix, Bastrop’s blues prodigies The Peterson Brothers, Austin's classical-meets-pop newcomers American Dreamer, Shake Russell & Michael Hearne…and that’s just part of the fest's first weekend line-up. The second weekend schedule includes Phoebe Hunt & the Gatherers, Los Texmaniacs, The Don Juans, and Kathy Mattea. The third weekend scheduled performers include Radney Foster, High Plains Jamboree, Welch Family w/Warren Hood, The Deer, Wood & Wire, and many more Texas-based artists. 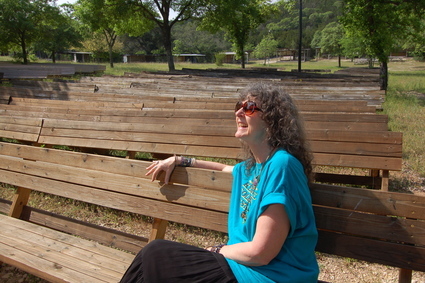 Kerrville Folk Festival Producer Dalis Allen in her natural habit, relaxing on the mainstage pews. Photo by Marc Fort. Allen recently sat down with us to talk about the origins of the festival, what artists she’s enjoyed nurturing at the very beginning of their careers, and all of the festival's affiliated programs and classes that nurture young artists and will keep the festival continuing for another 50 years. TMO: How many people do you expect this year? How many will the grounds hold? Allen: "(We can accommodate) 1,500 comfortably, and packed to the gills it's 3,500. The second, smaller theater holds 500, but can hold up to 1,000 if packed. The main stage operates on weekends only...with schools on the weekdays for harmonica and ukulele. Songwriter's and blues guitar schools are the first week. Harmonica and ukulele schools are the second mid-week. 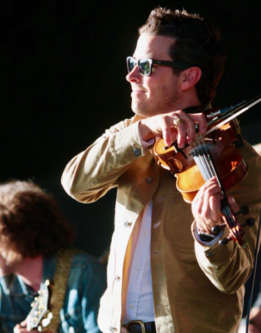 A lot of the artists that play the festival are also the faculty for the schools (for example Lloyd Maines and Terri Hendrix will perform on the first weekend, and teach at the schools during the weekdays)." TMO: How did the festival end up in Kerrville? Allen: “(Festival founder) Rod Kennedy was called by the Governor’s Office to come to Kerrville and plan an event in conjunction with the Kerrville Arts & Crafts Fair so that people would stay in town…because what would happen is they were coming out for the arts and crafts fair, and then going home, because it was a day event that ended at 5 pm. And so he created a music event in the auditorium downtown so that people would then buy tickets to that, and then stay over in town: heads in beds. “The first couple of years, it wasn’t a songwriters event, because he was just planning an event that had music, that would sell tickets, so that people would stay in town. And he was still living in Austin, and still doing all the events he had in Austin. And then, at some point, he discovered the mission within himself: the mission of support for songwriters...and people that write their own original music. And that’s when he created what the festival is now, an event only for songwriters. We don’t hire anybody that doesn’t write their own original music. TMO: Do you find it’s a lot of the same families attending every year? Allen: “We have 4th generation staff. And people have their 'Kerr-family,' or their 'Kerrville Family.' They don’t see them the rest of the year, but they camp with them here. And they have tribes and gatherings, and we have what we call ‘land rush,’ which means the people that wanna get their same spot, and camp with all their same people, come in the weekend before the festival opens, and they do literally rush-in and claim their spots in the campgrounds. So many of the families, their kids have grown up here and they still come back, and then they bring their families. Our staff in particular is 4th generation, but so are many of our ticket buyers. We have people that buy season passes for the whole 18 days, and there are some people that are lifetime ticket holders, but that’s from a long time ago that was part of a fundraising effort…and a lot of them still come every year. Who are some of the artists that you been proud to see grow at the festival? Allen: “That really harkens back to the New Folk program. The way we discover new artists is to host the New Folk Song Competition. And it’s not so much that we want them to compete with each other. But we just have no way to get to the ends of the Earth to hear everybody. So people come from all over the world and submit their songs to that, and 32 of them get to come here and play the songs that they submitted. And 6 of them take away the award. And we plan tours for them, and once they’ve toured together for a little bit, they become a very cohesive group. And they continue to do gigs together, and plan their own tours. "But I would mention Jimmy LaFave. That’s how he got here…through New Folk. And has been playing pretty much ever since. And a lot of people, like Lyle Lovett, and Nancy Griffith, and Lucinda Williams, Mary Chapin Carpenter, Hal Ketchum, John Gorka, James McMurtry…a lot of those folks were a part of New Folk very early in their careers. Every one of them. Whether they were a finalist, or the actual award winner, they all started here in some fashion, getting the acknowledgement and love for what they do. Rod coined the phrase, ‘We’re saving the world one song at a time.’ And the folk fest's foundation has picked that up as their slogan. "Because he felt like what the songwriters had to say was so important. And most people, a lot of people, their parents didn’t consider (what the songwriters were doing) a real job. And so he wanted to give it that: ‘we support it. We acknowledge it. We think it’s amazing.’ And so all of those artists, of the hundreds and hundreds and hundreds and hundreds that have come through New Folk...you could name maybe 100 that are household names now. Because everybody does something different. And not everybody got famous like Lyle or Nancy or Lucinda. But they did feel acknowledged for what they do. "New Folk started the very first year of the fest. It wasn’t as organized. The people that were winners that first year were kinda like, 'Yeah, I was just kinda hanging under the tree and playing, and someone heard it and liked it.' The first year it was The Flatlanders: Butch Hancock and Jimmie Dale Gilmore and Joe Ely sitting under a tree, hanging out. And Butch and Jimmy and a lot of people love to tell their versions of those stories, because there are hundreds of them." TMO: The festival seems to have maintained it's original spirit. Allen: "It’s quite amazing. The family feel of it. The heart of it. There are so many festivals that are fabulous and wonderful, but the relationships that are built here over a period of 3 weeks can’t happen in 3 days (at a normal festival)." Allen: "That’s what set’s this festival apart. They know they’re coming next year, so they’ve already asked for their vacation. Back in the early days, a lot of us were known to quit jobs so we could come to Kerrville." Allen: "It is a place where a lot of the touring musicians that don’t normally get to see each other stop, even if they aren’t playing that year. They come and hang out. So if you go down to the camp fires, there’s no telling who you might see down there..."
TMO: Is it true that they literally go all night? Allen: "Some of them. You can go down there at 4 or 5 o’clock in the morning and you’ll find somebody playing music." 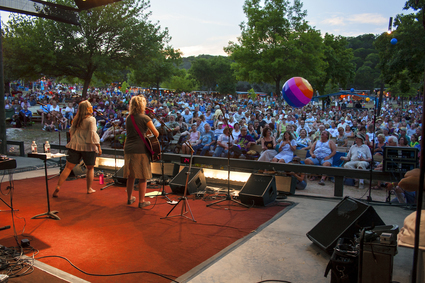 The 46th annual Kerrville Folk Festival runs May 25 thru June 7. For info on Kerrville Folk Fest ticket packages and single day tickets: http://www.kerrville-music.com/tickets. To see the complete festival line-up, click here. Interview by TMO marketing coordinator, Marc Fort. April took TMO staff to meetings with various industry sectors around TX, as well as a business development trip to Nashville. On Sunday, April 2, TMO Director Brendon Anthony joined Texas First Lady Cecelia Abbott in attending and addressing concertgoers at the "A Place to Stay Concert," featuring music from the newly released album "The Foster EP" by Texas singer/songwriters Radney Foster and Kyle Hutton. Anthony also joined the artists in performance at the concert (as pictured on above right; Photo by Diana Cox). The Foster EP is a collection of songs narrating some of the experiences of children in the Texas foster care system. On Tuesday, April 4, Anthony traveled to El Paso for multiple meetings with various El Paso music business professionals and music educators. Anthony was a guest lecturer in two classes at the University of Texas at El Paso, discussing he current trends in the music industry with undergraduate students. He also met with the owners of Sonic Ranch Recording Studios, one of Texas' leading professional recording studios. Friday, April 7th, Anthony joined many honored guests at the Paramount Theatre in Austin - including First Lady Cecilia Abbott - at the Texas Heritage Songwriter's Association's annual concert, this year honoring Guy Clark and Tamara Saviano. The next day, Saturday April 8, Anthony presented a proclamation from Gov. Greg Abbott to the Old 97's at their annual Old 97's County Fair concert (pictured left, with Old 97's singer/guitarist Rhett Miller). 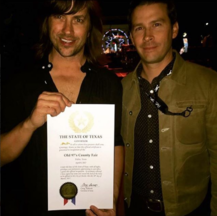 The County Fair has allowed the Old 97's to give back to their Dallas community, working with hometown production companies and giving back to their community with a family-friendly event. On Monday, April 10, Anthony traveled to West Texas A&M University with the TAMU System Chanellor John Sharp to learn about the University's new partnership with Nashville's Belmont University, wherein West Texas A&M students will be able to take classes from Belmont's prestigious music business program via a new distance learning program. On Thursday, April 13, Anthony spent the day in Dallas engaged in economic development meetings with various Dallas music businesses, including Hand Drawn Records, Palo Santo Records, Do214, Gavin Mulloy of Trees & the Bomb Factory, KXT Radio, Wordspace, Artist Uprising, and the Longhorn Ballroom. The productive day of meetings would not have been possible with out the help of former TMO fellowship intern, Dallas-based publicist Amber LaFrance, who set-up the entire day of meetings. 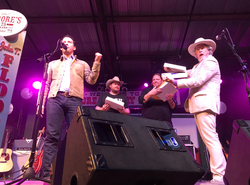 On April 14, Anthony traveled to San Marcos to present Floore's Country Store with a proclamation from Governor Abbott honoring their 75th anniversary, and their longstanding contribution to the development of Texas artists. The venue has proved to be a fertile, crucial part in the development of Texas country music artist's careers, including George Strait, Robert Earl Keen, Randy Rogers Band, and so many more. On April 19 and 20, Anthony traveled to Nashville, TN for a business development trip, meeting with the heads of licensing at BMI and ASCAP, as well as with several music publishers, advocating on behalf of Texas artists. 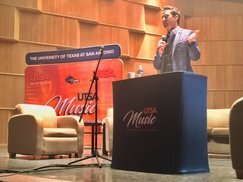 April 29, the entire TMO staff attended University of Texas at San Antonio's Music Biz Day, speaking on - and moderating - panels, allowing the UTSA students and the San Antonio music community to learn more about the music industry. Anthony (pictured on right) gave the keynote address, outlining the role the Texas Music Office plays in the music industry, and how music education is a key component in the development of the next generation of music industry professionals. Later that evening, Anthony attended the final day of Larry Joe Taylor's Texas Music Fest in Stephenville. And that evening Anthony presented an award at the Big Thought gala at the Granada Theatre in Dallas, celebrating Texas music. 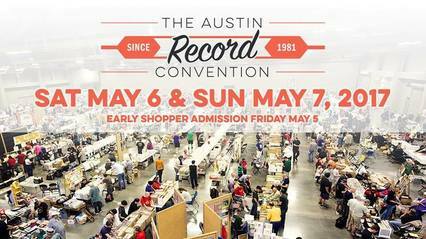 The record convention is located at 900 Barton Springs Rd, Austin, TX. The largest record convention in the United States finds fans young searching for treasures amidst the vinyl renaissance. From the 78 RPM records from the 1930s, to compact discs, to the come-back kid 33 1/3 RPM vinyl records, there are more than one million 78s, 45s, LPs, CDs, cassettes, posters, collectibles and music-related memorabilia available at the Austin Record Convention than at any one time, anywhere else in the country. Over 300 different dealers from all over the USA, Europe, and all over the world spread out over 50,000 square feet of floor space at the Palmer Events Center. The show is so big that to see everything takes most of the weekend. "If you're in a hurry we have tables where customers can post search announcements in hopes of locating specific items," notes convention founder Doug Hanners. The event started in 1981 and has been held twice a year, in the spring and fall, ever since. VIP / Early Shopper passes are available for $40 for those who wish to have early access to the show on Friday, May 5, from 10am to 5pm. General admission is $5.00, and is good for both Saturday, May 6 and Sunday, May 7. Friends of Nacogdoches Music is producing 3 festivals in 2017: Spring Mini Fest May 5-7, Nacogdoches Music Festival August 3-6, Fall Mini Fest October 5-7, and then in 2018 we will start with our Winter Mini Fest Feb 1-3. The Spring Mini Fest will be the smallest due to just getting our organization established, but the main festival in August will be bigger than last year's and the fall and winter festivals will be great, too! The Conroe Americana Music Festival is a grassroots premier festival featuring a mix of Bluegrass, Rockabilly, Folk, Texas Country, Roots Rock, Blues, and Americana music. Established through the Conroe Downtown Area Association (501c4) the proceeds of the festival will be used to enhance the Historic Downtown Conroe area with improved signage and beautification projects. The 3 Day Music Festival will feature 50 bands in 4-6 venues beginning Friday, May 5, 2017 at 6:00pm - midnight, noon-midnight Saturday, May 6, and Noon-6:00pm Sunday, May 7, 2017. 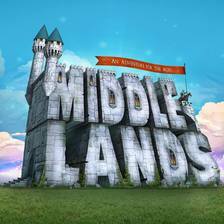 The creators of EDC and the minds behind Lollapalooza invite you to Middlelands - an adventure for the ages! 150 artists over 5 stages, 4 nights of camping & 3 days of music at the historic Texas Renaissance Festival Fair Grounds. Join your fellow Headliners in a community of friends at Middlelands camping, conveniently located at the festival site. The fest offers an array of camping experiences: from car camping to customized "glamping" environments. Whatever your preference, all are invited to create their own theme and sound camps. Ages 18 and up. Adopted in 2000 the UIL State Wind Ensemble Festival is unique among UIL music events. Participants in this event experiencing the following: there will be three evaluators who will provide a recorded and written critique of each band’s performance. There are no ratings or recognition of outstanding bands; In place of ratings and outstanding band awards, the evaluator panel will honor individual performers and/or sections for exemplary musical achievements. Appropriate awards (draped state medals) will be provided; Following each band’s concert performance a clinic with a nationally recognized music educator/conductor will be provided. The focus of this interaction will be on musicianship and the artistry of making music; In addition each band will be expected to structure a schedule that will enable the students to listen to the performance of two other performing groups over the course of the day. The Chamber Music Roundup Festival provides an opportunity for amateur musicians and students of all levels to enjoy working in chamber music groups with other music enthusiasts and to learn great compositions written for small ensembles. Faculty artists play with amateurs and students in the same ensembles! Program for each participant includes rehearsals in two different groups, orchestra reading sessions, history and theory classes, technique/sectional classes, coordinated sight-reading sessions, lectures, attendance of faculty concert, and final informal performance. Optional individual lessons could also be provided at additional cost. Observer option is available. Crude Fest, located just outside of Midland, Texas, is produced by Townsquare Media and is one of the premier music festivals in West Texas, featuring some of the biggest names from the Texas and Red Dirt music scene. Now in its eighth year, Crude Fest is a three-day music and camping festival that pays homage to the historical and vital oil and gas industry that is prominent in West Texas. It has become a yearly tradition that attracts attendees from in and outside of the oil and gas fields, but also fans coming from as far away as Canada. Crude Fest consistently puts out some of the best Texas Country & Red Dirt lineups, including names such as Randy Rogers Band, Turnpike Troubadours, Josh Abbott Band, Jason Boland and the Stragglers, Wade Bowen, Kevin Fowler, Whiskey Myers, Cody Johnson, William Clark Green and many more over the past seven years. 2017 marks Crude Fest’s eighth year, featuring ACM and Grammy Award winners Eli Young Band making their first-ever Crude Fest appearance, along with Josh Abbott Band, Cody Johnson, Stoney LaRue and many more. 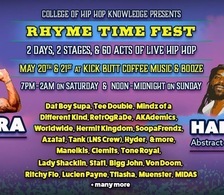 College of Hip Hop Knowledge is excited to announce the first annual "RhymeTime Fest." This is a 2-day Hip Hop Festival with 2 stages (Indoor & Outdoor) will feature an amazing lineup of over 60 live Hip Hop acts (the great majority of the acts are based in Texas). "On Saturday, May 20th, West Coast Hip Hop legends Abstract Rude, Aceyalone & Myka 9 (Haiku d'etat, Project Blowed, Freestyle Fellowship) headlining the days festivities! On Sunday, May 21st, East Coast Hip Hop Royalty & Gangstarr affiliate, AFU RA is flying in from the U.K. to come rock in the name of HIP HOP with us," notes the festival organizers. The Guadalupe Cultural Arts Center will host the 36th Annual Tejano Conjunto Festival May 24-28, 2017, at the historic Guadalupe Theater and Rosedale Park in San Antonio, Texas. The festival expects to draw over 5,000 Conjunto music lovers from across Texas, the U.S., Mexico, as well as international visitors. Executive Director Cristina Ballí will direct and curate the festival and Juan Tejeda, founder of the Tejano Conjunto Festival, will serve as advisor. The festival will feature about 30 of the very best and most popular bands in Conjunto music complemented by plenty of dancing, food and beverage booths in a family-friendly environment. 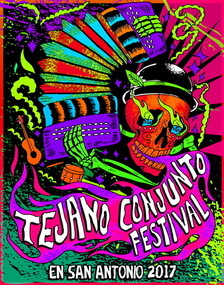 The festivities include special events such as the presentation of new inductees into the Conjunto Music Hall of Fame at a special gala event; a free Seniors Conjunto dance; an Accordion Tuning workshop; the Tejano Conjunto Festival Poster Contest; and the opportunity to win top-of-the-line Hohner accordion. These are just a small sample of the more than 50 events (from the month of May alone), all listed on our Texas Music Events Calendar. The Texas Music Office (TMO) is a state-funded business promotion office and information clearinghouse for the Texas music industry. The TMO assists more than 15,000 individual clients each year. 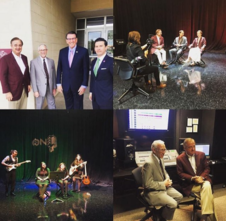 The office promotes the development of the music industry in the state by informing members of that industry and the public about the resources available in the state for music production."